Does your family love watching TV shows, movies, and sporting events at home? Do your kids often bring their friends over to play PS3, Xbox, or Wii video games for hours on end? Do you wish you had a dedicated media room for these activities? If you've answered yes to these questions, then maybe it's time to start designing your very own home theater. This does not have to be an overly complicated or expensive endeavor, especially if you take the time to plan every move beforehand. In fact, assuming you already have a suitable television, all you really need to add are some speakers, a few pieces of home theater furniture, and some accessories to finish the job. The holidays are actually a terrific time to get this project underway because a lot of the required electronic components and home theater seating will be on sale. This means you can end up saving a lot of money by getting started now. The size of the room will obviously determine how much home theater seating you can install. Smaller rooms might only be able to accommodate one or two Palliser Bullet power recliners, while larger rooms would be able to handle full-sized Lane Advantage or Lane Colston sectionals. Taking accurate measurements and checking product sizes and specifications before you buy are critical to getting your media room properly furnished. The television will be the focal point, of course, but from there you have to decide how you want to set up your speakers, components, and home theater furniture. 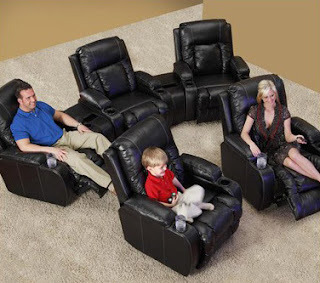 Some options to consider include a straight line of VIP Cinema Clayton recliners; a curved Palliser Benson sectional; or side-by-side Bass Penthouse chairs. For larger rooms, you can even have a double row of home theater seating for the look and feel of a real cinema. Electronic equipment can be contained on wall-mounted shelving, staged on the floor, or stored in an entertainment center cabinet. This will depend on space constraints as well as the type of mounting system you have for your television. For most people, budget plays a key role in what they can do with their media room. If you don't have a lot of extra cash to work with, then entry level units such as the Klaussner Twilight or Berkline Tangiers recliner should be at the top of your shopping list. If money is no object, then you can look at high-end home theater furniture like the Fortress Matinee or the Fortress Hudson. The same principle applies to the speakers and other electronic components you purchase. With a smaller budget, you'll have to settle for value-priced equipment, while a larger budget will allow you to buy the best products available. Setting up a dedicated media room with extra speakers and home theater seating is a project that will benefit the entire family. Take advantage of current holiday sales to get the electronic equipment and home theater furniture you need at the lowest prices of the season!